Project Aim: supporting health care professionals to bring every pregnancy to the happy end. Early detection of threats to mother and baby, including through CTG measurements, may have a real impact in quicker medical response during pregnancy. 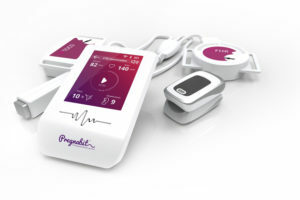 PREGNABIT system enables CTG monitoring of pregnant women at anytime and anywhere. Our mission is to support health care professionals, to bring every pregnancy to the happy end. StartUp Europe Awards 2017 recognition is very important to the whole Pregnabit Team. We work very hard to bring every pregnancy to the happy end. We strongly believe that StartUp Europe Awards 2017 will help us to fulfil our mission.